So far, Congress' response to the health care crisis has been alarmingly disappointing in three ways. First, by willingly accepting enormous sums from health care special interests, our representatives have obligated themselves to their benefactors' interests rather than to those of the American people. More than 3,330 health care lobbyists - six for every member of Congress - contributed more than one-quarter of a billion dollars in the first and second quarters of 2009. A nearly equal amount has been contributed on this issue from non-health care organizations. This exchange of money prompted a Public Citizen lobbyist to comment, "A person can reach no other conclusion than this is a quid pro quo [this for that] activity." Second, by carefully avoiding reforms of the practices that drive health care's enormous cost growth, Congress pretends to make meaningful change where little is contemplated. For example, current proposals would not rebuild our failing primary care capabilities, which other developed nations depend upon to maintain healthy people at half the cost of our specialist-dominated approach. They fail to advance the easy availability and understandability of information about care quality and costs, so purchasers still cannot identify which professionals and organizations are high or low performers, essential to allowing health care to finally work as a market. They do little to simplify the onerous burden associated with the administration of billing and collections. The proposals continue to favor fee-for-service reimbursement, which rewards the delivery of more products and services, independent of their appropriateness, rather than rewarding results. Policy makers overlook the importance of bipartisan proposals like the Wyden-Bennett Healthy Americans Act that uses the tax system to incentivize consumers to make wiser insurance purchases. And they all but ignore our unpredictable medical malpractice system, which nearly all doctors and hospital executives tell us unjustly encourages them to practice defensively. Most distressing, the processes affecting health care reflect all policy-making. By allowing special interests to shape critically important policies, Congress no longer is able to address any of our most important national problems in the common interest - e.g., energy, the environment, education, poverty, productivity. Over the last four years, a growing percentage of individual and corporate purchasers has become unable to afford coverage, and enrollment in commercial health plans has eroded substantially. Fewer enrollees mean fewer premium dollars available to buy health care products and services. With diminished revenues, the industry is unilaterally advocating for universal coverage. This would provide robust new revenues. But they are opposing changes to the medical profiteering practices that result in excessive costs, and which often are the foundation of their current business models. And these two elements form the troublesome core of the current proposals. Each proposal so far contemplates additional cost. But we shouldn’t have to spend more to fix health care. Within the industry's professional community, most experts agree that as much as one-third of all health care spending is wasted, meaning that a portion of at least $800 billion a year could be recovered. There is no mystery about where the most blatant waste is throughout the system, or how to restructure health care business practices to significantly reduce that waste. Make no mistake. A failure to immediately address the deep drivers of the crisis will force the nation to pay a high price and then revisit the same issues in the near future. It is critical to restructure health care now, without delay, but in ways that serve the interests of the nation, not a particular industry. Congress ultimately must be accountable to the American people. The American people must prevail on Congress to revise the current proposals, build on the lessons gleaned throughout the industry over the last 25 years, and directly address the structural flaws in our current system. True, most health industry groups will resist these efforts over the short term, but the result would be a more stable and sustainable health system, health care economy and national economy, outcomes that would benefit America's people, its businesses and even its health care sector. Finally, the American people should demand that Congress revisit and revise the conflicted lobbying practices that have so corroded policymaking on virtually every important issue. Doing so would revitalize the American people's confidence in Congress, and would re-empower it to create thoughtful, innovative solutions to our national problems. Brian Klepper is a health care analyst and industry adviser. David C. Kibbe is a family physician and a technology consultant to the industry. Robert Laszewski is a former senior health insurance executive and a health policy analyst. Alain Enthoven is Professor of Management (Emeritus) at the Stanford University Graduate School of Business. Julie Appleby has an important article today at Kaiser Health News. She has identified an important and before unreported issue in the Senate Finance health care bill. In order to keep the cost of the plan down, the Senate Finance bill literally locks in the erosion of insurance subsidies for middle class families. "The first year the legislation would take effect, people getting subsidized coverage would be required to pay from 2 to 12 percent of their incomes for insurance. The government would pick up the rest of the tab. People with lower incomes would pay less and those with higher incomes more. "But in the second year, it changes. From then on, it is based on a percentage of the premium that was paid the first year, no matter how far premiums rise. "For years, health insurance premiums have risen faster than wages, and the trend is expected to continue." "Let's assume in subsequent years that the family’s income kept pace with inflation and they remained at 220 percent of the federal poverty level. They would continue to pay 29 percent of the cost of the premium. But because premiums are likely to rise faster than inflation, Solomon’s analysis found, the family’s cost would soon rise above 8 percent of their income. "Since 1999, insurance premiums have jumped 131 percent, while wages increased 38 percent, according to the Kaiser Family Foundation. (KHN is a program of the Foundation.) This year, the average premium for all family policies rose about 5 percent, to $13,375 annually, the foundation reported, while workers’ wages rose 3.1 percent." “They did this to make subsidies a little cheaper,' says Karen Pollitz, director of the Health Policy Institute at Georgetown University. 'But it means that if you’re [a low-income policyholder] struggling in the first year, it will get harder and harder … unless we have some massive breakthrough in cost containment' and the growth of premiums slows." This isn't the only example of the Senate Finance authors using the same gimmick to lower costs. The 40% "Cadillac" benefits tax has the baseline for calculating the tax tied to the CPI plus 1% while the cost of health insurance has historically risen three to four times inflation. The result will be that more and more people will get caught in this AMT-like tax trap as the years go on. "The Senate's tax would initially apply to all individual policies costing more than $8,000 a year, or $21,000 for a family. Those thresholds are to be indexed to the overall consumer price index (CPI) plus 1 percent. Problem is, medical costs and health insurance premiums increase a good deal more than the overall CPI. Since 2000, they have risen three to four times faster -- which means, more policies will be subject to the tax with each passing year. The congressional Joint Committee on Taxation has calculated that in 2013, when the reforms kick in, the tax will apply to 19 percent of individual plans and 14 percent of family plans, but that by 2019 it will sock 34 percent of individual plans and 31 percent of family plans." While the word is that Senate Majority Leader Harry Reid is going to increase the baseline--to $23,000 for a family for example, the same principle would apply--the baseline for calculating the tax will almost certainly rise much slower than the cost of the insurance trapping more people into the tax every year. These gimmicks that would take advantage of higher health insurance cost inflation when compared to general inflation or similar wage rates have the effect of making the health care bills cheaper by tens of billions of dollars keeping the cost under the $900 billion objective the President has set. This gimmicky approach to health care reform isn't terribly different from failed Democratic attempts to peel out the $250 billion Medicare physician fee fix last week, arguing the Medicare physician fee problem is not really part of what comes under health care reform. By trying to add that $250 billion to the deficit last week and their apparent ongoing attempts to keep this physician fee issue out of the health care bills, setting an AMT-like tax trap in the "Cadillac" benefits tax scheme, and now setting up middle class families for significant erosion in their subsidies as another budget gimmick, all to keep the ten-year price of the bill under $900 billion, Democrats are making a mockery of the President's claim when he said "we can't just keep kicking this [health care fiscal] can down the road." It appears that Harry Reid is going to include a robust Medicare-like public option in his Senate draft. Speaker Pelosi is also doing her best to put as robust a public option in her House version as she can get the votes for. One press report after another has proclaimed the return of the public option. I’d like to see some of these reporters to do a vote count. No doubt the hype over the public option is at an optimistic level. No doubt Reid and Pelosi’s opening bid will be aggressive on the public option issue. In the Senate you will find the only health care game in town that in the end will matter--how to get to 60 votes. There haven’t been anywhere near 60 votes for the robust public option all year, or even something close to it, and there are not today. Reid is reportedly going to include a robust Medicare-like public option with a state opt-out. That means there would be a federal Medicare-like public plan but that a state could opt out. Opting out would mean that both houses of a state's legislature and its governor would have to agree to opt out. That’s a pretty high hurdle and it is not going to appease the moderate Democrats in the Senate, or any Republicans including Snowe, who oppose a robust public option. We could have a public option only if a “trigger” occurs. That is Senator Snowe’s general idea. OK, define that trigger. Do you think for one moment a liberal’s definition of a trigger will come close to a moderate’s definition of a trigger? It is the last week in October and we’ve been hearing about a trigger for months. Have you seen a definition of it yet? Then there is the possible course in the House—a public option that has to negotiate with providers just like a private health plan does—“arms’ length negotiations.” For liberals, how is that different than a co-op and its inability to gain any real kind of traction? For moderate Democrats, it will likely be seen as the “wolf in sheep’s clothes.” Maybe a place to compromise but hardly the robust government plan its proponents are looking for and there is no evidence that this idea will attract those moderate Senate Democrats that don’t like the public option. Then there is the state opt-in. The idea is that both the state’s legislative branches and the governor would have to agree to opt-in. This could well win moderate Democratic support because very few states would do it and it is attractive to states' rights moderates who would like to see state experimentation. This is a possible place for compromise but hardly a robust public option. As I have said many times before, there will not be a robust Medicare-like public option or any form of a thinly veiled Medicare-like public option. When the day is done liberals will be satisfied to get what they can to get a bill across the line. In my mind, the bigger issue continues to be how Democrats will balance individual affordability and paying for the thing. Predicting the outcome of yesterday's Senate vote on the $245 billion deficit adding doc fix was easy. Democratic Senate Majority Leader Reid was going to sail this thing through the Senate with almost all Democrats and even a bunch of Republicans onside. Senators are afraid of the docs—after all they have voted for years to waive any cuts. Democrats needed to get this $245 billion cost out of the final health care bill to have any chance of coming in under a trillion dollars in cost and make their bill "deficit neutral." Lots of Republicans would even join the Democrats in approving it overwhelmingly having no courage to face down the most powerful health care lobby of all. "I don't bring anything to the floor unless I think I have the votes," Reid said to reporters while answering a question about the big lack of support for the Medicare doc fix. "I was told by various people that we'd have 27 Republican votes, which seemed reasonable since Senator Jon Kyl was the co-sponsor of this legislation. So I was stunned when I was told by his co- sponsor, Senator Stabenow, that, no, he wouldn't support it"
The final vote was 47-53 killing the measure with Independent Lieberman and 12 Democrats joining all of the Republicans. Because when the day was done the swing votes on this just couldn’t bring themselves to vote in favor of cynical politics and adding another $245 billion to the deficit instead of putting this back where it belongs—a key part of health care reform. Then today this: A report from the Office of the Actuary at the Centers for Medicare and Medicaid Services (CMS) carried an unusual disclaimer, saying that; “it does not represent an official position of Health and Human Services or the rest of the administration." I guess not. Here is what it said: "While health spending as a share of gross domestic product would grow to 20.8% under current law, the study found that the House bill would cause it to grow to 21.3% of GDP." Why? Because covering more people in essentially an unchanged system will cost more. Dah. The Administration quickly pointed out the report doesn’t reflect recent updates to legislation designed to save money—a controversial contention in its own right. So much for bending any curves. There was no word on whether the Obama administration would move to revoke CMS's anti-trust exemption in retaliation for getting off message. In a town steeped in the cynical traditions of politics a bunch of Senators and some career federal health care experts both chose to do the right thing during the last 24-hours. If they keep this up we just might find our way to real health care reform some day! Last week the health insurance trade association (AHIP) released a report it sponsored, and was authored by PricewaterhouseCoopers (PwC), that claimed the Senate Finance bill would be problematic for the insurance markets only leading to much higher costs. As I posted last week, my own analysis of the Finance bill gives me big concerns about what it would do to health insurance costs and the integrity of the small group and individual health insurance pool. When you are going to issue a report of the kind AHIP and PwC did—in terms of its intended consequences on a national political debate--you better be sure you can back-up everything you say in simple and unambiguous terms. The ineptitude on the part of AHIP and PwC is startling. That either organization was not able to clearly and decisively defend their conclusion in the midst of the health care reform finals is one thing. That they couldn’t defend a conclusion that is generally right and consistent with common sense is even more startling if not aggravating. But then AHIP starts from way behind anytime it has tried to do anything in this town. You will remember AHIP as the organization that briefly got the NAACP to support the extra payments to Medicare Advantage arguing paying the HMOs more was a way to improve benefits to poor seniors. Then there was the Congressional hearing this summer where three of their members told a House committee that they planned to continue retroactively canceling individual health insurance contracts even when they found only inadvertent and immaterial errors on the original applications. When you have that kind of track record and lack of credibility and you want to issue a game-changing report you better have every duck in line. I swear, if AHIP issued a press release on a crystal clear day telling DC the sun was shining no one would believe them. In spite of AHIP's and PwC's failings the fact is that the Senate Finance bill’s insurance market reforms are severely flawed and have to be fixed or costs will be much higher than they would have been anyway and, more importantly, efforts to make the health insurance market more accessible for the uninsured to guaranteed coverage will be undermined. Here is a table produced by the Center on Budget Priorities (via Thursday's WSJ) comparing the net cost of health insurance families would be expected to pay for coverage under each of the three pending bills (you can click on it to enlarge). Under the Senate Finance bill, coverage for the poor and near poor would be pretty accessible and affordable—a family of three making $27,465 a year would have to pay only $1.236 a year, or $100 a month. Fair enough. But look at what happens when you get close to the median American income ($52,000 a year). At $54,930 a year in income that family would be required to pay $6,592 net of the subsidy. How many families making $54,930 have an extra $500 in their monthly household budget? A family of three making $73,240 a year—middle-class as it gets—would have to pay $8,789 for a policy that would have a deductible of $3,000 a year! Know any families like this with an extra $9,000 in their checking accounts? Now consider the Senate Finance penalties for going without coverage. In 2013, for example, there would be no fine for not having insurance. By 2014 the penalty would be $200 per adult and it would rise to $400 in 2015, $600 in 2016, and $750 by 2017. But the Finance bill also eliminates medical underwriting and pre-existing conditions in 2013—anyone could go to the insurance exchange and at any time and demand a health insurance policy at normal rates that would begin paying their medical bills immediately no matter how sick they were. Faced with no fine in 2013, why would lots of these families pay $6,592 or $8,789 a year in premiums when they could just skip coverage until they needed it and it was clear they could make money on the deal? Even in 2017 when the penalty was just a total of $1,500 for mom and dad they would be thousands ahead waiting until they got sick to buy coverage. Given normal health care trend, the required family's share of premiums would likely rise by thousands of dollars more over the years. While the House and Senate bills have stiffer penalties that would discourage families gaming the system you will note that their premiums aren't much more affordable for the middle-class. Critics of the PwC report often point to the fact that PwC did not take into account the value of the new federal insurance subsidies in doing their evaluation. The family costs I just gave you are net of the subsidies. Critics point to the fact that PwC did not assume that insurance costs could be lower given the efficiencies the insurance exchanges would likely bring to the market. That is fair. But any efficiency gained by lower marketing costs, a relatively small part of the overall cost pie when compared to medical costs, will quickly be swallowed up and overwhelmed by much higher prices wracked by an insurance market plagued by gross anti-selection that can only occur in this scenario. It has been argued that the Senate Finance bill sets up a $20 billion reinsurance pool to reimburse health insurers in the individual market for unacceptable claims experience. That is right but the $20 billion is collected from the insurers themselves and is really a mechanism to smooth results between insurers and among product lines--it will not fundamentally lower costs if the entire individual pool is coming in higher because of systemic anti-selection problems. Some have argued that things are running just fine in Massachusetts. Really? I hear the insurance exchange trend rate is pushing 15% (price increases and offsetting benefit cuts together). Harvard Pilgrim recently told us that, "Between April of 2008 and March of 2009, about 40% of the people who purchased individual insurance from Harvard Pilgrim stayed covered by us for less than 5 months. Even more amazing, they incurred, on average, about $2,400 per person in monthly medical expenses - roughly 600% higher than what we would have expected." In spite of the AHIP/PwC “gang that can’t shoot straight” the Senate Finance bill is clearly flawed and needs to be fixed or it will drive health insurance prices up far more and make access even more problematic. And, while the Congress is at it, the same middle-class subsidies need attention in the other bills as well. Apparently, Democrats are getting ready to pay-off the physicians for their support of the health bills by quickly fixing the Medicare Sustainable Growth Rate (SGR) fee cut problem off-budget and ahead of the pending health care bills. Physician lobbyists met with several key lawmakers and administration officials Wednesday to push for action. "Senate Democratic leaders made a procedural move Tuesday night that allows the chamber to bypass the usual committee process and take the $245 billion fix, proposed by Sen. Debbie Stabenow, D-Mich., straight to the floor. ... Leadership has indicated the merger will be swift. ... The fix faces three tough procedural hurdles that each will require 60 votes: a cloture vote, a budget point of order because the measure is not offset and a motion to proceed to the bill, a lobbyist source said." How many times have you heard the President say that any health care bill must be "deficit neutral?" How many times have you heard conservative and moderate Democrats say they won't vote for a health bill that isn't paid for? What are the Democrats about to try? Peeling out one of the biggest components of health care and quickly spending $245 billion to bolster physician fees over the next ten years, doing it separate from the "deficit neutral" health bill, and just adding the $245 billion cost of this to the deficit! To do it they will need 60 votes in the Senate and most of the "Blue Dogs" in the House. We are about to see just how fiscally responsible these moderate Democratic senators are and whether or not the Blue Dogs aren't just "Yellow Dogs." With the passage of the Senate Finance bill the health care effort now moves to a critical stage with the Senate Majority Leader and the House Speaker now clearly in charge. The more important effort will be Reid’s. Pelosi’s final product will be more predictable (very liberal) but Reid’s will have to be more practical. Every inch Reid moves away from the more moderate Baucus bill will cause problems. The big issue is going to be money—just whose taxes are going to get raised to the tune of $500 billion to pay for it. The Senate Finance bill has the $211 billion “Cadillac” benefits tax. Dead on arrival. No way the party that put the unions ahead of the Chrysler bondholders is going to cross their traditional allies on this one. The $40 billion tax on medical device makers is also under pressure and likely to at least shrink. And, don’t think the insurance underwriting reform issue is behind us. That one is just beginning and it will create its own pressure to increase the cost of any bill by improving insurance subsidies so an individual mandate is workable. The Finance bill also ignores the Medicare physician payment problem. Don’t fix that and you risk alienating the docs. The House did fix it and it cost them $240 billion they still haven’t found the money for. The Senate Finance bill minus the “Cadillac” tax, fewer medical device taxes, the imperative to improve the subsidies, and in need of a doc fix has about a $500 billion hole in it. The House solves that problem with a $500 billion tax on “millionaires”—defined as families making more than $500,000 a year. But lots of Democratic Senators think that is really just a tax on small business and job creators. The Dems would have no chance holding Olympia Snowe's vote with a tax on small business given that the Maine Senator has a well deserved reputation for being one of the Senate's strongest advocates for them. If the House tax could have passed the Senate yesterday afternoon Baucus would have had it in his bill rather than the “Cadillac” tax placeholder he did have. Bottom line: The Democrats have to figure out a way to get 60 Senators to vote for a tax scheme that will raise at least $500 billion. The public option, employer mandates, a turbo-charged MedPAC? These are not the biggest issues. The White House will take any deal they can get and will quickly pressure liberals to back off wherever necessary. The biggest issue they face by far is just whose taxes are going to get raised $500 billion. This is the make or break issue. Readers of this blog know that I have lots of concerns for the Senate Finance health bill primarily because it does not so much represent health care reform as just an expensive entitlement expansion. Readers also know the insurance lobby--AHIP--is not one of my favorite organizations. But I will tell you the report by Pricewaterhouse Coopers (PwC) commissioned by the AHIP and released this morning is accurate. The Senate Finance bill would do nothing short of blowing up the insurance market. You don't need to be Einstein or a PwC actuary to come to that conclusion. Common sense is all the credential you need. Beginning in 2013, the Senate Finance bill would make uninsured individuals eligible for premium credits to buy a health policy. But those credits would leave these people far short of being able to really afford a health insurance policy. A family of four at 250% of poverty and making $55,000 a year ($52,000 is the median household income in the U.S.) would have to pay about $4,000 toward their premiums and that for a policy with a $1,000 deductible and a maximum of about $7,000 in out-of-pocket costs each year. At 300% of poverty, $66,150, a family would be required to pay $8,000 in premium for a policy with a $3,000 deductible! How many families making $55,000 a year or $66,000 a year do you know that could add this kind of expense to their annual budgets? It is really no better for a family making 400% of poverty, or $88,200 a year. They would have to pay $10,600 a year in insurance premiums for that policy with a $3,000 deductible! Senate Finance, knowing they could not enforce this kind of individual mandate to buy health insurance then set about to exempt many from paying a fine (if it costs more than 8% of income) or just gutting the fine if they did not buy the coverage. But starting in 2013 the Senate Finance bill says that the insurance companies have to get rid of medical underwriting and pre-existing conditions provisions. So in 2013, any consumer could simply go to the health insurance company and demand to be covered under any one of the mandated benefit plans. No medical underwriting before getting in and no pre-existing condition limitations. Just sign the application and go to the doctor. In one sense you can understand the political logic here--the Democrats can't very well mandate middle class families to pony-up $4,000, or $8,000, or $10,000 out of their already challenged budgets. So they just found a way to exempt them or make the fine a tiny one. But they left the insurance reforms in place. Let me ask you a question. Why would any family buy health insurance under such a scheme? I will suggest the answer is that they will buy it when they need it. No sooner. Even in 2017, a family with two adults would pay no more than a $1,500 annual fine against a premium that would be $4,000 to $10,000 a year in these middle class income brackets. I'll give you another one. Why would any small employer provide health insurance? I will suggest the answer to that one is the smart small employer will just cash-out any benefits they do provide today and tell the employee t0 pay the fine until they need it and then go to the exchange and get it (there is also no small employer mandate in the bill to provide coverage). The worker would likely be thousands of dollars ahead each year! The problem the Democrats have here is that they are trying to get a health bill to cost under $1 trillion. That has made them back off on premium subsidies and policy benefits. They have had to back so far off that the Democratic proposals are not offering health insurance policies anything close to being affordable for middle class families. The political response in Senate Finance has been to waive the individual mandates but keep the underwriting reforms. The sum of it all is a health insurance market disaster in the making. In the business we refer to it as a "death spiral." Simply, the higher the premiums go the fewer that will buy, the sicker the pool, the higher the premiums go once again, even fewer people are left in the pool, and so on until all of the sick are in the pool and all of the healthy have left it. The PwC report says that average family premiums of $12,300 today will rise to $25,900 under the Senate Finance proposals in 2019. They say premiums would be driven by these underwriting reforms, cost shifting from Medicare cuts, and new insurance taxes simply being passed through to consumers. I don't know if the PwC report is exactly correct, but as to its conclusions regarding the gutting of the mandate to buy insurance and that insurance company taxes will be passed through to customers, common sense certainly takes one to about the same conclusion. Frankly, I thought it would be worse. The Senate Finance Democrats could not have created a bigger insurance pool train wreck in the making than the one they have devised here. What is really amazing is how all of these Senators sitting around that Senate Finance table have just sleep walked their way through all of this as if they don't have the common sense to figure this out on their own. With Baucus gutting his fine for not having health insurance there would be no reason for people to buy it. In 2013, for example, there would be no fine for not having insurance. By 2014 the penalty would be $200 per adult and it would rise to $400 in 2015, $600 in 2016, and $750 by 2017. Coupled with the expectation middle class families would have to pay $6,000 to $10,000 a year for insurance we could be on our way to devastating the health insurance risk pool. That problem could be exacerbated by the choices policymakers make on the issue of age rating bands. On the one hand, community rating (everyone pays the same price) would be ideal. After all, that is effectively what every member of an employer plan benefits from. But to get the younger people in the pool--particularly in the face of mandate penalties that are all but evaporating in the Democratic proposals--the premiums younger folks would pay need to be attractive. That is without driving the costs up to prohibitive levels for older Americans. With the Baucus proposal all but gutting the penalties for not buying insurance and without affordable premiums for everyone, it is hard to see how enough young and/or healthy people could be attracted in order for there to be a workable insurance pool. 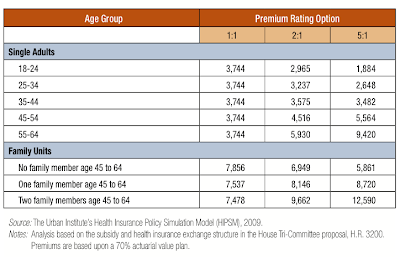 "Urban Institute researchers used their Health Insurance Policy Simulation Model to calculate the financial implications of age-based premiums under three different scenarios. They found that regardless of the rating option, there would be little difference in overall health insurance coverage or total spending. However, the affordability of health care costs (premiums plus out-of-pocket expenses after any government subsidy) will be strongly related to the age-based premium rating. "For example, a 55- to 64-year-old buying a nongroup policy but ineligible for a low-income subsidy would face average medical costs topping $10,600 under 5:1 age rating, but about $7,400 under 2:1 rating. Medical costs would be about $5,500 under pure community rating (1:1), where premium prices would be the same regardless of an applicant’s age. "For many older adults and older families, the higher out-of-pocket costs that come with greater medical use in older age, combined with higher premiums due to a steep age rating (such as 5:1), would lead to a high burden of health care costs relative to income." So, in a community-rated program everyone would pay the same premium. That would be great for older people but very expensive for those in their 20s. But to get a single adult premium for a 20-year-old down to $1,884 a 60-year-old would have to pay $9,420 each year under the 5:1 scenario! Consider this against the current Baucus proposal that would fine each uncovered adult nothing in the first year of the program and never more than $750 in the out years. Then factor in the limits on how much premium subsidy families and individuals would get-- under the House bill for example. Under the House Energy bill a family making 250% of poverty ($55,125) would be required to pay 8% of their income up to $4,416 a year for a policy that could have a deductible of $1,000 and a $7,450 out-of-pocket cap. At 300% of poverty ($66,150), the House Energy bill would limit a family’s insurance costs to 10% of annual income or $6,612 a year with a deductible of up to $2,400 and an annual cap of $8,520 in our-of-pocket costs. A family making 400% of poverty ($88,200) would be expected to pay as much as 12% of their annual income or $10,584 a year for their insurance that could have a $3,000 deductible and a $10,000 annual out-of-pocket cap. The Democrats appear to be headed toward a health care bill with subsidies very much like these while also gutting the individual mandate. "So, let's see, our family making $66,000 a year can either pay $6,600 a year for health insurance or pay no fine at all in 2013, or a $200 per adult fine in 2014, but still have the right to apply for insurance without a concern for medical underwriting or pre-existing conditions whenever we get sick." Americans will make a real simple calculation: "At what point can I make money on this deal." That could be a disaster for the creation of a workable insurance pool! Carl McDonald is a Managing Director at Oppenheimer & Company. He is one of the most followed health insurance industry analysts who can regularly make stock prices rise and fall with his comments. Today, he and colleague James Naklicki offer an "editorial" on the current health care proposals pending in Congress. I will suggest that their analysis of the impact of potential "reform" on consumers, the states, and the health insurance industry are well worth your time. The current health reform legislation has a lot of objectives, but two key goals are to provide coverage to all Americans and to control the growth in health care cost trends. The legislation currently pending in Congress would achieve partial success in covering more people, but we think it will fail miserably in slowing health care costs. Because there's so little in the bill that actually deals with cost, we wouldn't be surprised if reform actually caused health care trends to accelerate more than if we'd done nothing. And so while health reform is laudable for its efforts to cover more people, it just isn't a very good outcome for the country. In this piece, we look at where the health reform discussion will turn to in the final few months of debate, with the focus likely on the consumer groups that stand to lose the most, and the issues the legislation will have working in the current health care market. Seniors in the Medicare Advantage program will face higher premiums and lose valued benefits, while younger people (a key Obama demographic in the last election) will have to pay significantly more for their health care, since they will now be subsidizing the older sicker members of the population. The relatively modest subsidies to help people buy insurance and the very minor penalties for not having insurance, coupled with a significant illegal immigrant population, mean that the uninsured population will still number 10-20 million even after this legislation, raising the question of whether we should be spending almost $1 trillion on reform. The taxes levied on health insurers will ultimately be passed onto employers and consumers, raising premium rates by over 1% each year, meaning that the middle class will be funding at least a portion of the coverage expansion. In addition, states will be covering a large chunk of the Medicaid expansion. Because states have to balance their budgets each year, this will likely result in higher state income, sales, and property taxes, which will have a disproportionate impact on the middle class. "Well now, Mr. Scorpion! How do I know that if I try to help you, you won't try to kill me?" asked the frog hesitantly. "Alright then...how do I know you won't just wait till we get to the other side and THEN kill me?" said the frog. The scorpion shrugged, and did a little jig on the drowning frog's back. The parallels between this story and health reform are so good it requires no further explanation. Health reform has a lot of objectives, but two key goals are to provide coverage to all Americans and to control the growth in health care costs. The legislation currently pending in Congress would achieve partial success in increasing insurance coverage in the country, but it will fail miserably in slowing health care costs. In fact, because there's so little in the bill that deals with health care costs, we think there's a greater probability that reform will actually have the opposite effect, and cause health care costs to rise faster than would have been the case without the legislation. So while health reform is laudable for its efforts to cover more Americans, it just isn't a very good outcome for the country. Let's get my biases out of the way. I follow health insurance stocks for a living, so naturally I'd prefer that the health insurers continue on in their current form. But since all of the provisions that would have put the industry out of business (like a government run health care plan with significant competitive advantages over existing insurers) seem dead and buried, a seismic shift in how the industry does business over the next few years doesn't seem to be in the cards, even if the group's current valuation multiple says differently. So with the group sticking around for the foreseeable future, my job as an analyst is to objectively predict what future stock prices will do, and I can be just as right with a call that reform will change little and that the group's multiple will return to 10x as I can with a view that the legislation will seriously inhibit the ability of health plans to ever earn a margin again. In other words, as long as the group is still around, I don't have a particular bias on whether it does well or not. But this piece is about the bigger picture, not stock prices, and my friends in politics tell me that negative advertising always gets more attention, so with that in mind, in the list below I've run through some of the issues I have with the legislation, and the consumer groups that stand to lose the most from it. Some of these topics have been discussed extensively in the press over the past month, while others are the stories I suspect will be receiving a lot more attention in the weeks to come. It's not an exhaustive list, to be sure, but it does provide an overview of what the major challenges will be for the health reform legislation in its final few months of debate. The figures cited below are largely derived from the latest Baucus legislation in the Senate Finance Committee, since this bill has the highest likelihood of serving as the framework for the final legislation. The legislation will put an enormous amount of pressure on the federal budget, because it does almost nothing to control medical cost trends. The current legislation kicks the cost question down the road, and it will ultimately mean that either significant tax increases or painful benefit reductions will be necessary to cover the cost of what will be the country's third significant underfunded entitlement program. When health reform legislation was first being discussed during last year's election, I thought that if it happened, everyone in the health care system would have to share the pain. Consumers wouldn't get as much and would have to pay more, while all the health care industry groups would have to give up their pound of flesh. As I sit here today, that is not at all the case. Consumers are being told that not only will they receive better and more efficient care, it will also be less expensive. And all of the industry are giving up a little bit, but what the pharma, med device, and health insurance industries are losing is more of a flesh wound than a pound of flesh. Because of all the unnecessary care that is delivered in the country, it is theoretically possible to improve the quality of care without significant benefit reductions or major cuts. But there isn't much in this health reform bill that really goes after that problem, so it just doesn't seem logical that everyone can get more (or least keep the same) and that no one pays the price without the federal deficit ballooning. To pay for health reform, Congress is proposing a somewhat equal split between Medicare payment reductions and increased taxes. We'll get into some of the taxes below, but let's be clear on the Medicare payment reductions. Reducing what a hospital or doctor is reimbursed by Medicare does not save any money. Numerous studies and examples show that two things generally happen when Medicare rates are reduced. The first is that providers shift additional costs onto paying commercial customers. This is one of the major reasons why commercial medical cost trends always rise at a significantly faster pace than Medicare trends. Second, providers tend to utilize more. In other words, it seems like providers have a revenue target in mind, and they tend to be fairly agnostic as to whether that goal is achieved through unit cost or through utilization. So cutting Medicare rates does reduce federal government expenditures, but from an overall cost perspective, nothing changes. Health care costs simply get moved from the federal bucket onto employers. It will be years before we have to deal with the cost question, but that doesn't make it any less important. With most of the reform initiatives not implemented until 2013, it will take at least a year or two to see what the true cost of the new entitlement program is. Whatever the year of atonement turns out to be, it will ultimately mean either that the subsidies to purchase insurance will shrink, the benefits provided reduced, or taxes increased. The tax on plans with rich benefits will ensnare an increasing number of people each year, because the threshold is set to rise at the rate of inflation, while health care costs grow significant faster than inflation. One of the major revenue generators of the health reform bill is a 40% excise tax on health insurance plans with rich benefits that exceed $8,000 a year for singles and $21,000 for family coverage in 2013. Note that the threshold includes health insurance coverage as well as dental, vision, and other supplementary health insurance coverage. This provision isn't a big deal today, since $8,000 a year works out to $667 per month, and most people don't have policies that cost anywhere near that much. The key to understanding this excise tax is that the threshold only grows at the rate of inflation plus 1%, and health care costs grow at a significantly faster pace. So it won't be long before many people in the country have plans worth more than $8,000 a year and become subject to the excise tax. There are some policies out there today that will exceed the $8,000 threshold. These tend to be union health plans, or for employees of city and state governments, or policies for those who work in high risk professions. The latter group appears to be spared some relief along with retired individuals over age 55, since the threshold amount for these two groups will be increased by $1,850 for individuals and $5,000 for family coverage under the latest version of the legislation, but it still isn't clear to us that union leadership will be willing to go along with this provision, since the costs of the excise tax will be passed onto their members. The taxes on insurance companies will be passed directly onto consumers and employees, resulting in higher premiums that will impact the middle class. The excise tax noted above will technically be assessed to the health insurers, but much like the premium taxes that some states currently charge, the excise tax will be passed onto employers on a dollar for dollar basis. This will result in higher premiums, and in response, employers will likely either slim down the benefit design, or pass on more costs to employees in the form of higher copays and deductibles. There is a separate assessment of $6.7 billion on the health insurance industry that will also be passed onto consumers in the form of higher premiums. The industry generates around $500 billion in premiums on an annual basis, by our estimate, so a nearly $7 billion annual tax would increase premium rates by about 1% a year, by our calculation. If the tax applies only to commercial insurance (and excludes Medicare and Medicaid), then the impact on premium rates will be even more significant. If the $6.7 billion tax is implemented in 2010, it will create capital issues for a number of smaller plans in the industry, pushing market share to the larger plans in the industry. As noted above, while this tax will ultimately be passed onto employers and consumers, there is a nuance in the timing. Since this reform bill won't pass until very late in 2009 (if it does at all), most 2010 plans will have already been re-priced by the time companies know whether the tax will be in effect next year. As a result, most plans would be unable to pass the tax onto employers next year, and have to absorb the hit themselves. It would be a pretty meaningful impact, considering that industry profitability is probably about $15 billion or so on an annual basis. Moreover, the tax is not deductible. Plans like United or WellPoint clearly have no interest in paying the tax, and will do what they can to avoid it, mainly by arguing that it should be pushed until at least 2011. However, in the worst case, United and WellPoint certainly have the capacity and the capital to pay the tax. The same cannot be said across the entire group, as there continue to be a number of smaller non-profit plans with thin operating margins and capital levels that are just above regulatory requirements. Take Blue Cross Blue Shield of Rhode Island. The company seems pretty well capitalized at the end of 2008, with a risk based capital level of almost 745%, well above the Blue Cross industry average of 700%. However, on a dollar basis, the excess capital held by the Blue amounts to only about $205 million relative to the minimum capital allowed by the Blue Cross Blue Shield Association. In 2008, the Blue generated about $1.76 billion in premiums, or about 0.35% of the total estimated revenue for the industry. That implies that the Blue in Rhode Island would be responsible for paying about $23.5 million of the $6.7 billion tax. With this legislation, over 10% of the excess capital of the Rhode Island Blue would be wiped away. And that's for a plan that's extremely well capitalized relative to the rest of the industry. Coventry just bought a plan in Kansas this week called Preferred Health Systems. If we look at the larger of the two subsidiaries that was bought, called Preferred Plus of Kansas, it had a risk based capital ratio of 320% at the end of 2008, as it held about $11.6 million of excess capital at the end of the year above the minimum 200% RBC ratio requirement. With $285 million in revenue, Preferred would be responsible for 0.06% of the $6.7 billion tax, or almost $4 million. So the legislation would eliminate about a third of the excess capital of the plan, and reduce its RBC ratio to 280%. So while paying the tax in 2010 probably wouldn't put many smaller plans out of business, it would create some capital issues that would have to be rectified through higher premium rates in the ensuing years in order to build the capital base back up, which would likely result in further market share gains by the larger plans in the market, resulting in less competition, a direct contradiction to one of the goals of the legislation. The penalty for not having insurance coverage is too low, and it will result in many people choosing to just pay the fine rather than purchasing insurance coverage. The individual penalty is $750, which is too low, but it will also be phased in over many years. In 2013, for example, there is no fine for not having insurance. By 2014, the penalty is $200, and it rises to $400 in 2015, $600 in 2016, and $750 by 2017. So there really won't be an individual mandate in 2013, but plans will still be required to issue a policy to anyone that wants one, and charge premiums based on community rating, rather than individual underwriting. This is a recipe for adverse selection, which will raise premium costs across the entire health care system. In 2014, when the penalty is $200, the decision to not buy health insurance will be pretty easy for most, since consumers will be faced with paying the $200 penalty once, or paying over $200 every single month to buy insurance. Individuals will be exempt from the excise tax if the premium of the lowest cost option available exceeds 8% of their adjusted gross income. This decision will be particularly easy for the younger, healthier segment of the population with few health care costs. They will see little value in buying an expensive health care plan, and many will gladly pay the penalty. However, for community rating to work with any reasonable degree of success, young and healthy people are necessary to subsidize the cost of coverage for the older and sicker. Otherwise, you end up with a situation that New York currently suffers through, as the cost of a real individual policy in the state can exceed $1,000 per month because of the guaranteed issue, community rating requirements without an individual mandate. Along these lines, because of community rating, young people in the population (a demographic that was a major supporter of Obama in the last election) will be forced to pay significantly higher premiums for health care coverage, because they will now have to subsidize the costs of older, sicker workers in the population. Aetna has been particularly vocal on this topic, which is likely because it is one of the newer entrants to the individual market, and likely has one of the youngest and healthiest books of individual business in the market. Senator Jon Kyl, a Republican from Arizona, noted in a Senate Finance hearing that a family of four, including two 35-year-old parents and two children, currently could buy a CIGNA PPO plan in Phoenix for $512 per month. Under the reform plan being pushed by Senator Baucus, Senator Kyl claimed that the price of the policy would nearly double to almost $1,000 a month. While the premium figures may not be exactly correct, directionally, the comment makes a very important point. The subsidies provided to enable people to purchase insurance through the exchange are not large enough, and will result in a number of people being forced to buy insurance that they can't afford, or pay a penalty. Individuals with modified gross incomes up to 300% of the federal poverty level would be eligible for what the legislation calls a premium credit. The subsidy available will be determined on a sliding scale based on income. For someone with an income at 100% of poverty, premium costs would be capped at 2% of income, while someone at 300% of poverty would have premium costs capped at 12% of income. Those with income between 300-400% would also have premium costs capped at 12%. The federal poverty level for a family of 4 today is $22,050, so at 400% of poverty, that works out to $88,200. Using the 12% of income threshold works out to nearly $10,600. That's not to say a family of four would need to buy a policy that expensive, but they wouldn't receive any federal assistance or exemption from the penalty, unless their insurance costs exceeded that amount. The point here is that this family of four in our example that is today uninsured will receive almost no assistance from the government in paying for their health care coverage, and it seems unlikely that most families in this situation will have the resources to come up with the $6,000 ($500 per month) it would take in most states to purchase a reasonable family policy. The result of the small penalty for not having insurance and the relatively small subsidies means that tens of millions of people will remain uninsured following this legislation, so it isn't wise to believe that the uninsured problem will disappear with this bill. Keep in mind that of the 45 million uninsured today, something in the neighborhood of 10 million people are illegal immigrants who will receive no coverage under this legislation. Add to that the millions of people who will choose to go without insurance and pay the penalty, or simply won't be able to afford the cost of the premium, and the uninsured issue will remain a major problem. We suspect this will be a major focus of the Congressional Budget Office (CBO) as they review the changes made by the Senate Finance Committee during the mark-up process, and it will raise the question of whether we should be spending something around a trillion dollars on a health reform bill that could still leave 15-20 million people uninsured. States will incur significant new costs covering the expanded Medicaid population, forcing them to raise taxes, which will impact the middle class. One of the reasons the Senate Finance bill is less expensive than some of the prior versions is because the SFC chose to push more of the costs of Medicaid expansion onto the states. The legislation would establish 133% of the federal poverty level as the new mandatory minimum Medicaid eligibility level, beginning on January 1, 2014, which would increase the Medicaid population by around 10 million by most estimates. Beginning in 2014, additional assistance would be provided to states to cover the cost of all newly eligible beneficiaries, with states that currently offer no coverage for the newly eligible population receiving more assistance than states that already have programs in place. Between 2014 and 2018, that additional assistance would be adjusted so that by 2019 all states would receive the same level of additional assistance. Additional payments would be made to "high need states" that would cover the full cost of the new eligible population for five years between 2014 and 2018. For states that are already struggling to pay for their Medicaid programs today, the idea that they will be responsible for covering a huge influx of new members seems impossible. In addition, states are concerned that people currently eligible for Medicaid but not enrolled in the program will come forth in greater numbers. The state of Tennessee has estimated the bill would add about $1 billion in extra Medicaid costs for the first five years after expansion, while California has estimated the expansion could cost around $8 billion each year. Because states are required to balance their budgets, these additional Medicaid costs will result in major funding cuts to other areas, or more likely tax increases that will cause income tax, sales tax, and property taxes to rise. On this point alone, it's hard to argue that the middle class will be spared from paying for a big portion of the health expansion. Seniors, particularly those enrolled in the Medicare Advantage program, will see premiums increase and benefit reductions because of the funding cuts proposed in the legislation. While it has been a favorite saying of the Administration to note that seniors will not see benefits reduced because of the proposed Medicare cuts, even the Congressional Budget Office concedes that Medicare Advantage premiums will rise and benefits will be reduced as a result of the funding cuts proposed in the legislation. While it's certainly reasonable to question whether it is fair that seniors enrolled in the Medicare Advantage program receive extra benefits, the fact of the matter is that those benefits will be reduced or eliminated over the next five years if the health reform legislation passes. With all the focus on providing health insurance coverage to beneficiaries, no one seems to have focused on whether we have the infrastructure and provider access to actually provide care to all these newly insured members. Massachusetts appears to have had some issues with provider access after passing their health reform legislation, as an Urban Institute report earlier this year found that one in five adults reported being told in the past 12 months that a physician or clinic was not accepting new patients or would not see patients with their type of insurance. Lower income residents had greater difficulty finding a physician, according to the study, as 24% of residents enrolled in state-subsidized health plans were told a doctor didn't accept their insurance, compared with 7% of residents with private coverage. So while the legislation may be successful in adding 10 million people to the Medicaid rolls, reducing the uninsured rate through health insurance exchanges, it isn't clear that physicians have the capacity and willingness to serve all the newly insured members, particularly if they are being paid at Medicaid reimbursement rates. All in, if the health reform legislation currently pending is enacted, it seems the goal of expanding health care access will achieve limited success while making health insurance more expensive for many. I was in a private meeting last week where I heard a longtime and influential Washington insider describe her view of the Obama health care effort. Her point was that the White House has approached the effort more from an ego perspective than a solid policy effort. That this is more about scoring a “W” over health care and therefore making a mark on history than it is actually being prepared to really reform the system. Looking at the Baucus bill, and its hodgepodge of policy decisions aimed at getting Senate votes far more than working to make health care affordable and “bending the cost curve,” I can see that logic. The President had an enormous opportunity to show real humility this morning by doing what about 80% of the country, and probably the world judging from today’s press reports, very much would have wanted him to do—say this is nuts and that he will pass until the day he can hopefully demonstrate real accomplishments that merit the award. I really hope President Obama does win the Nobel Peace Prize—in 2017 when he would leave office with hopefully many noble accomplishments. But this response to so ridiculous a decision by the Nobel Committee only makes me wonder about those remarks my friend made about ego. Back home in the Midwest I know exactly what they are thinking today: This guy needs some come-up-ins to get that ego under control. So, what’s the next big goal on his agenda to change us all? This president, by accepting this award, just might have unwittingly created even more opposition to his health care efforts if only because he has today dramatically increased the cynicism directed at his administration. Milliman consulting actuary, Robert Dobson, is out with a must read paper for those that think the "Cadillac" health plan tax makes sense. "The idea of taxing so-called Cadillac plans may not sound unreasonable upon first glance. But an actuarial view quickly reveals that the high cost of these plans has as much to do with the characteristics of the covered population as it does with benefit richness. It also reveals that the method of determining the taxable benefit threshold may create unintended consequences — especially when coupled with other benefit-level requirements under various reform proposals, leaving little room between benefit floors and the ceiling in certain slices of the insurance market." "The most common interpretation of this proposal is that the tax would apply to Wall Street bankers with the richest group benefit plans, and it may well be that taxing particular plans whose premiums are otherwise tax-deductible makes sense. But the actuarial reality of a tax indexed to a specific dollar-amount ceiling is that it would likely affect others with less rich benefits. Whether someone hits the ceiling is not so much driven by benefit richness as it is by age, gender, profession, health status, and the geography of the covered population. "Consider this example from the Milliman Medical Index (MMI): in 2009, the cost of healthcare for a typical family of four in Miami covered by an employer-sponsored PPO is $20,282.2 The cost of care for a similar family in Phoenix is less than $15,000. "While these numbers include employee cost-sharing (copays, deductibles, and other coinsurance are reflected in the MMI totals but are not subject to the excise tax), they still show how much more susceptible certain areas of the country are to hitting a fixed-dollar excise tax threshold such as $21,000. Given that medical costs have trended upward at a rate of between 7% and 10% over the last five years, one is left to wonder if the average Miami family will find its benefits exceeding the tax-triggering ceiling by the time the tax provision is imposed in 2013. "The question of age and gender is also relevant. Assuming a similar employer-sponsored PPO plan, the national average per-member per-month (PMPM) cost this year for an age-30 male is $155 per month — less than $2,000 per year. For an age-60 female, however, the PMPM is $717 — or $8,604 annually, which exceeds the excise tax threshold or ceiling. So groups that include retirees and older workers (e.g., public employers such as school districts) can be expected to hit the threshold more readily than groups with only younger active employees, even if the groups have identical benefits. "Those who do not exceed the threshold in 2013 might still see their benefits taxed in the future. Aging is the most obvious contributor to higher cost over time. But there is also the question of how the threshold is scheduled to escalate. As currently proposed, the threshold amounts are indexed to the Consumer Price Index for Urban Consumers (CPI-U) as determined by the Department of Labor beginning in 2014 [Amended to CPI+1%]. In the last year, CPI-U actually decreased, compared to a 7.4% increase in healthcare costs reported by the MMI between 2008 and 2009. Furthermore, that 7.4% is the lowest increase in at least five years. Assuming healthcare cost increases will continue to outpace the CPI, the tax threshold will catch more people each year. "The comparison has been made elsewhere, and deserves mentioning here, that the Cadillac excise tax could behave similarly to the alternative minimum tax, dipping further into the middle class than intended. As currently drafted (and discussed above), the tax is indexed to a number that does not reflect the reality of healthcare cost increases. In fact, the Congressional Budget Office (CBO) estimates that the revenue from the tax will be $5 billion in 2013 but increase to $53 billion by 2019 (emphasis added). This dramatic increase in the CBO’s revenue estimates over a six-year period is consistent with the point made above: The fixed-dollar indexing of the tax threshold will cause the application of the excise tax to quickly dip substantially further into the mainstream of health plans." This is just a very valuable contribution to the discussion and I suggest you take a look at it all here. It is pretty clear to me that millions of middle class Americans would get caught in this AMT-like tax trap. If we want to discourage excessive and inflationary health care benefits, a laudable goal, let's be direct about that. But let's not pretend to be going after some rich guy on Wall Street all the while knowing we have set a tax trap for a retired teacher in Miami. It’s decision time. The Congress will or won’t pass a major health care bill during the next few weeks. Will we get health care reform in 2009? Almost certainly not. As I have been saying for months, if we get a bill it will be more a trillion dollar entitlement expansion funded by relatively minor provider cuts and about $500 billion in tax increases. That is not health care reform. Will we get that trillion-dollar entitlement expansion health care bill? That outcome lies in the coming convergence on Capitol Hill of three extraordinarily powerful, and contradictory, forces. After more than 60 years of trying they have never been closer to adding a third leg to their domestic policy legacy of Social Security and Medicare. Leaders in the party are cognizant that this is their chance to do what both Roosevelt and Johnson accomplished and join them in their place in history. The leadership and the White House will do anything they can to get any bill that qualifies as a breakthrough. If they can get this to within a handful of votes in the House and one or two Senate votes they will drag this thing across the line. Can you imagine a Senator or House member trying to deflect the pressure they will be under if they turn out to be that last vote the Democrats need? “Senator, the party has been trying to do this for 60 years. If this fails it will not be the President’s fault or the leadership’s fault. It will be on your head to explain to the Democratic Party why, after all of these years and getting so close, you alone chose to give the President and the Party what could be a crippling legislative defeat instead of a generational victory.” Sort of like becoming the Billy Buckner of the Democratic Party! The polls are at best split about down the middle. The Rasmussen Health Care Tracking Poll has consistently showed support for the President’s efforts on health care—really a proxy for the entire Democratic effort—in the low 40s and opposition in the mid-50s. It is now clear that the town meetings were more than just the far right making a lot of noise. Just how do you pass something as far reaching as a health care bill with an approval rating in the 40s? While a bill is highly likely to clear the Senate Finance Committee in the next few days, the real negotiations will first be in each house as both Reed and Pelosi try to draft something they can pass on their own. If that happens, then the most critical negotiation will begin as the House and Senate reconcile their bills and the tendency of the House to move farther left and the Senate to expect something more moderate. They still don’t have a way to pay for it. Every time they have put a tax on the table it has come off that table in just a few days. The current taxes aren’t so much agreed to as just the last generation of unpopular proposals that are serving more as placeholders than final decisions. The House has a tax on the “rich” the Senate doesn’t like while the Senate has a tax on “Cadillac” health care plans that the unions can’t wait to kill once it emerges from under Baucus’ control. There is also a real unease over the combination of middleclass premium support subsidies, the bare bones character of the health insurance policies people would get, and the fines they would pay if they did not comply with the individual mandate. Republicans are going to continue hammering on the new “taxes” this would create. If Democrats increase the subsidies they have to find more money to pay for it. If they exempt the middleclass from the mandate what good have they done for what are a lot of swing voters already anxious about all of this? If millions are exempted from the mandate, the insurance industry will have a problem covering everyone and eliminating pre-existing conditions and medical underwriting provisions. Then the states are almost unanimously balking at more Medicaid unfunded mandates in the out years of the bill. Add to that the debate over an employer mandate, a MedPAC with policy powers, and growing criticism of Medicare Advantage cuts. And, that is before the thousand-page bill sees the light of day and who knows how many more “death panel” scares. On top of all of this there is the public option issue. As I have been saying since spring, there won’t be a Medicare-like public option. But just how will the Democrats finally compromise this issue. Co-ops are fizzling and there is one big devil in the details for any kind of trigger. Recent suggestions for the states running the insurance market for the near poor and proposals to give states the flexibility to create their own public plan would add an almost byzantine complexity to what is already a complex bill. If you take the “Cadillac” tax out of the Senate Finance bill and add in the more than $200 billion for a Medicare doc fix, you’ve created an almost $500 billion gap to fill. So, there are these three powerful, and contradictory, forces about to converge on Capitol Hill. Just how will they finally sort-out? That will make for the most fascinating domestic political battle in recent history. The President has said many times this health care debate is about "health care security." But the fact is that, under the Democratic bills now being considered, many middle class families (those making between $50,000 and $100,000 a year) would not be able to afford to buy a health insurance policy even with the proposed federal government subsidies. The Senate Finance Committee is in the process of rightly concluding that mandating some of these families to pay that much makes no sense. How many families making as much as $80,000 a year do you know who have an extra $10,584 a year sitting in their checking account (and that for a policy with a $3,000 deductible)? So, they are getting ready to exempt as many as 2 million people from the mandate. But what happened to "health care security?" When the day is done the bad news is that many of these middle class families still won't have insurance but the good news is that they won't have to pay a fine. So what have we accomplished? Wyden is concerned that under the legislation, nearly 200 million Americans who receive coverage through an employer would be barred from shopping on the new exchange. He also worries that providing a "hardship waiver" to families that cannot afford insurance leaves too many without coverage. "People don't hold rallies saying, 'Thank you for my exemption,' " he said. "Rather, they want us to deliver more affordable coverage." It may be time for the Congress to take a deep breath and take a broader view of where they are headed. Are we going to spend close to a trillion dollars on a health care bill and end up just exempting many of the uninsured middle class from fines they don't have to face today?